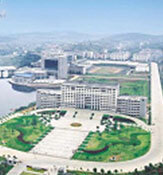 Shaoyang University was officially founded in 1958, with its medical school dating back to 1906. 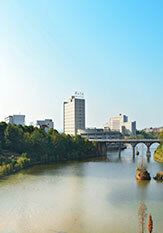 It is a public university owned and managed by People’s Government of Hunan Province, and is authorized by the Ministry of Education of People’s Republic of China to award both bachelor and master’s degrees. With 3 campuses in total, the University covers an area of 2376 mu (1.6 million square meters) and the total building area amounts to 723,500 square meters. Its fixed assets are estimated 1.069 billion yuan (＄164 billion ).The university library has a collection of 1,776,800 volumes and its e-books’ volume reaches 840,000. The library also owns 24 academic database and 1,700 academic journals. Shaoyang University has established 23 well-equipped laboratories of various types, including 4 provincial level demonstration laboratories, 129 bases of education and production practice. 4 of its programs are recognized as “Ministry of Education (MOE) Featured Programs”. 1 of its programs is listed as “Central Government Special Fund Sponsored Programs”. And 1 of its courses is named “National-level Excellent Open Courses”. The University has two affiliated hospitals and one collaborative affiliated hospital, which are all Class A tertiary hospitals. More than 70 hospitals are available for its interns to receive training. Shaoyang University now boasts 20 departments, among which there are 2 master’s programs (food engineering and mechanical engineering). It offers 61 undergraduate programs covering 11 branches of learning, namely economics, law, pedagogy, literature, history, science, engineering, agriculture, medical science, management, art. As of now, Shaoyang University enjoys a nationwide enrollment of more than 25,000 full-time undergraduate and postgraduate students. It employs 3,312 full-time faculties, of whom, 155 are professors or chief physicians, and 545 are associate professors or associate chief physicians. 772 of its lecturers are doctoral or master’s degree holders. Prof. Guojie Li, a fellow of Chinese Academy of Engineering, serves as the honorary president of the University. In recent 5 years, 887 research projects in total, including National Key Research Projects, Chinese National Natural Science Foundation Projects, Chinese National Social Science Foundation Projects, and provincial level research projects, have been managed by the University. The University receives 150 awards for teaching and research, and its publications amount to 5,200, of which 363 are included in SCI, EI, and CPCI-S. It also witnesses the publication of 85 scholarly monographs. The University actively seeks international exchange and cooperation, and has established partnerships of various kinds with universities from more than 10 countries such as UK, US and Australia. The Sino-foreign cooperative education programs developed by the University’s Weiyuan International College are widely appreciated. The University is approved to admit international students from 2011. The University attaches great importance to talent cultivation. Over the past 5 years, students from the University received 563 awards for entering contests and competitions of various kinds, such as “Challenge Cup” National Undergraduates Ex-curricular Academic and Science Competition (known as Chinese college students academic “Olympics” events), China Undergraduate Mathematical Contest in Modeling (CUMCM), National College Mechanical Innovation Competition, National College Mechanical Innovation Competition, National Undergraduate Electronic Design Contest (NUEDC) , National Advertising Art Design for College Students, National English Competition for College Students (NECCS), among which national-level prizes including 29 first prizes, 60 second prizes, and 133 third prizes. In the 2016 nationwide college students music talent show “Voice of Campus”, the team from Shaoyang University took the crown. The great achievements made by the university in recent years have received massive media coverage. A number of technologies have won national patents and the achievements through university-enterprise cooperation are remarkable. With the school motto “orientation of virtue and truth, and pursuit of symbiosis and transcendence “being continuously upheld, Shaoyang University is an ideal university for study and research with restful environment and picturesque view.